The "D5 Medical & Life Science Seminar" course will be offered by International Research Center for Medical Sciences (IRCMS). It will run from April 2019 to March 2020, with lectures given by scientists who are affiliated with IRCMS or in collaboration with researchers at IRCMS. The lectures will be given once a month, in English, and by leading scientists in the relevant research field. Students will be taught: 1) how normal physiological functions are maintained in the human body; 2) how abnormalities in these systems (e.g., cancer) are studied using experimental models; 3) cutting-edge technologies (including single cell level imaging and omics analysis) used for mechanistic understanding of these abnormalities; 4) efforts and progresses in finding cure for human diseases associated with these abnormalities; and 5) importance of understanding disease mechanisms using cross-disciplinary approaches. Speaker : Ben D. MacArthur, Ph.D. Title :Machine learning of cell identities from single cell expression data. Modern experimental methods allow us to profile the entire transcriptome of thousands of individual cells in a single experiment. The data derived from such experiments potentially allows us to dissect the molecular identities of individual cells in exquisite detail. However, the data is complex and high-dimensional, making it challenging to analyse. Therefore, in order to make the most of new experimental advances, we also require developments in computational methods that are able to make sense of this inherently complex data. 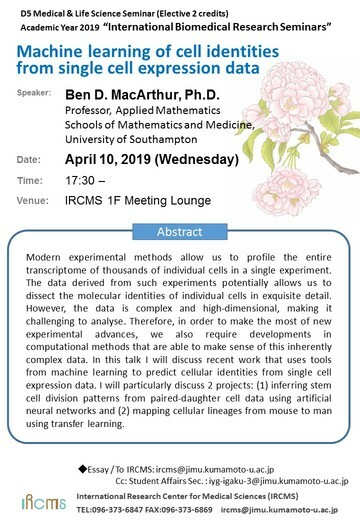 In this talk I will discuss recent work that uses tools from machine learning to predict cellular identities from single cell expression data. I will particularly discuss 2 projects: (1) inferring stem cell division patterns from paired-daughter cell data using artificial neural networks and (2) mapping cellular lineages from mouse to man using transfer learning.